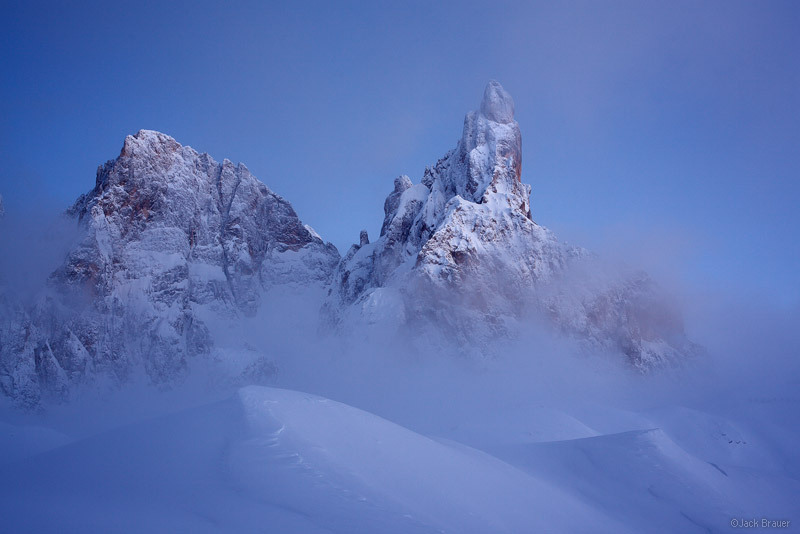 Cimon della Pala is revealed glowing in evening light as low clouds thin out from Passo Rolle. In the last few months I’ve been steadily working on reorganizing my photo archives in Lightroom, and during the process I’ve unearthed quite a few gems that I had overlooked during the initial selection process. So in the next few days and weeks I’ll be sharing many of these finds. 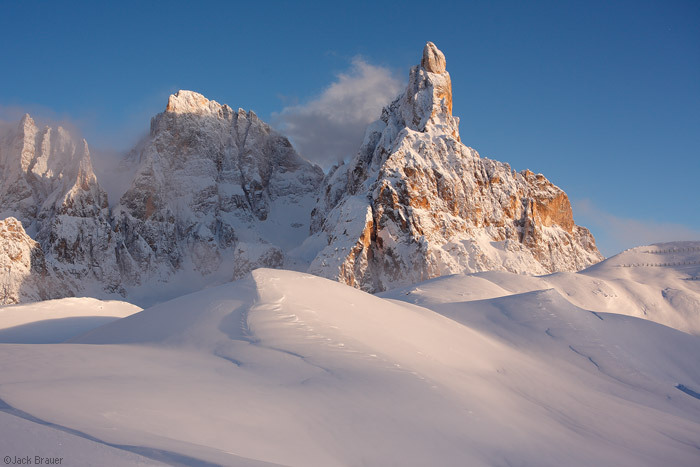 Cimon della Pala rises over Passo Rolle high above the town of San Martino di Castrozza – December. This first batch comes from December of 2010 when I spent a week in the small town of San Martino di Castrozza in the Italian Dolomites. 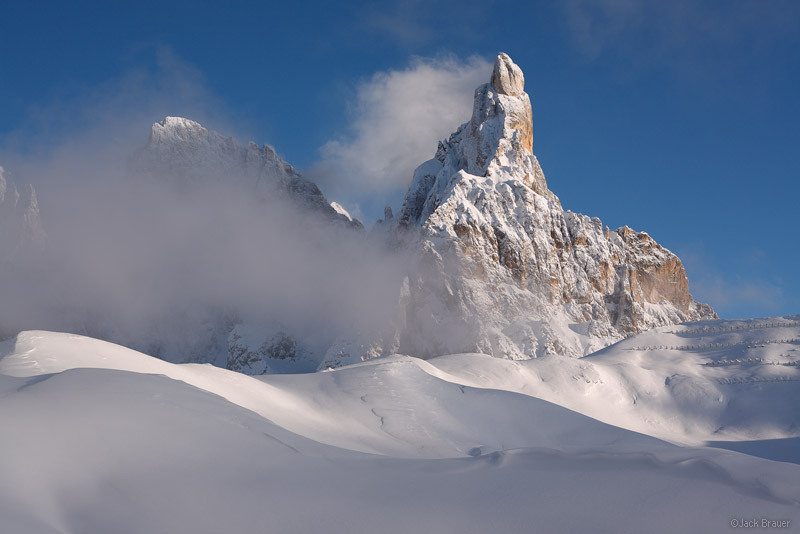 Every day I’d drive my rental car up the winding road to Passo Rolle to ski around looking for a variety of photo angles of the immense jagged spire of Cimon della Pala – one of the most striking peaks in a region full of striking peaks. 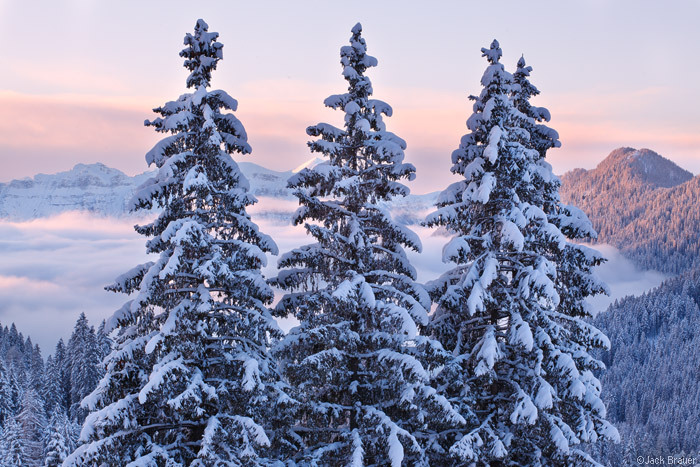 A December snowstorm envelopes the mountains around Cimon della Pala. Check out more of my photos from the Dolomites here. 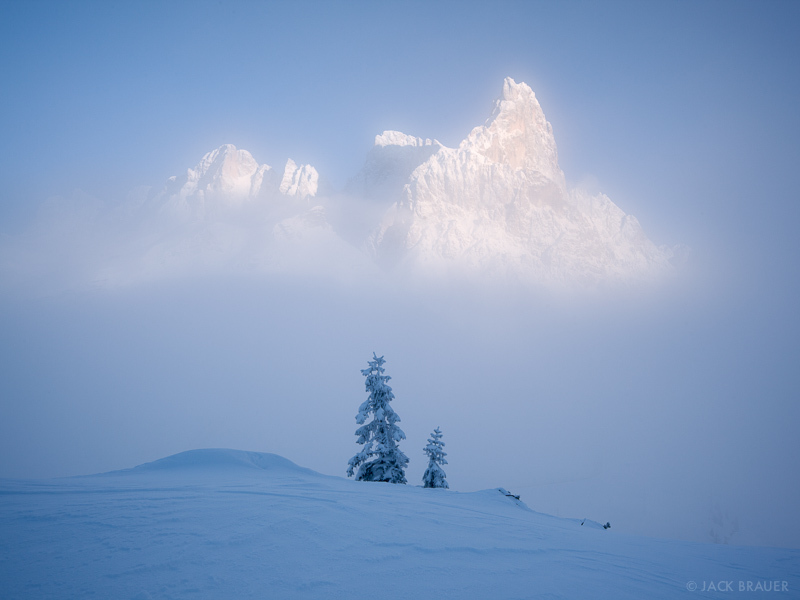 Posted in Alps & Europe, From the Vault and tagged Dolomites on May 18, 2014 May 18, 2014 by Jack Brauer. Climbing along the ridgeline of Molignon during the Via Ferrata Laurenzi. Posted in Alps & Europe, Backpacking & Trekking and tagged Dolomites, Italy on August 17, 2013 November 21, 2013 by Jack Brauer. 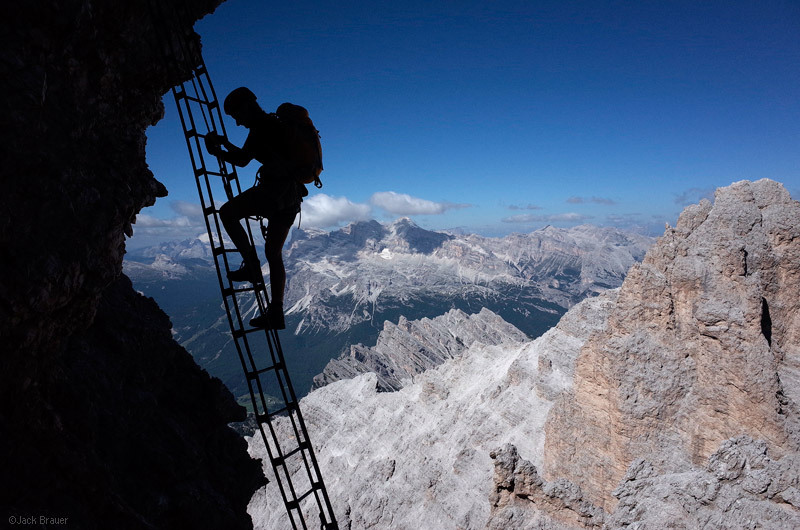 Ascending a ladder along the Cristallo via ferrata. Last week Claudia’s father and brother drove down from Dresden to join us in the Dolomites in northern Italy for a fun week of hiking and climbing via ferrata routes together. The via ferrate are climbing routes with fixed cables and ladders, and by using a climbing harness with two short ropes with locking carabiners, it’s possible to safely climb exposed routes without technical climbing skills. Posted in Alps & Europe and tagged Dolomites, Italy on August 12, 2013 November 21, 2013 by Jack Brauer. This morning I woke up early and drove from San Martino to Arabba, enjoying the awesome Dolomiti views the whole way. Upon arriving in Arabba, I quickly reserved a room here, then immediately went to the ski hill! 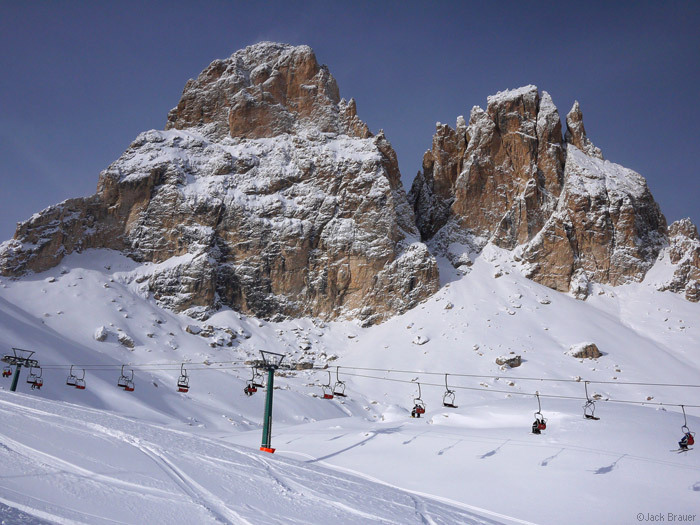 I had no idea what to expect, and was delighted to hear that the entire Dolomiti Superski area was open, and that I would be able to do the Sella Ronda, a famous and unique ski route that links four ski areas and circumnavigates the entire Sella Group of mountains via 42km of pistes and something like 12 chairlifts and gondolas (I lost track). This is a novel concept to me, and although the terrain is mostly cruising groomers, I enjoyed covering so much ground on my snowboard, and gawking at the incredible Dolomite spires and walls all around. And of course I found a few powder stashes along the way! 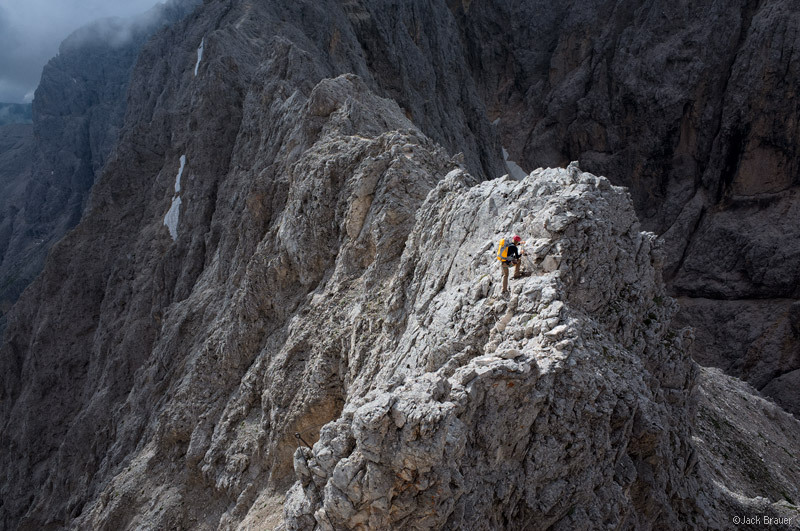 Marmolada, 3343m, one of the biggest peaks in the Dolomites. Chairlift under a couple of the rugged Sassolungo peaks. 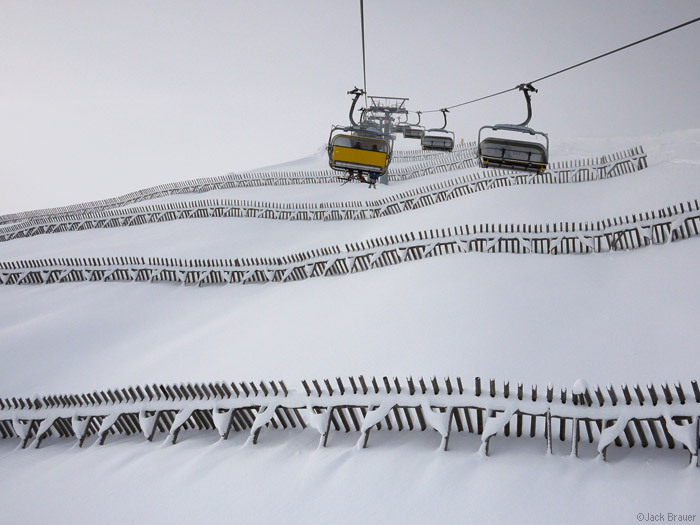 Posted in Alps & Europe, Skiing/Snowboarding and tagged Dolomites, Italy on December 5, 2010 May 19, 2013 by Jack Brauer. Arrivederci, Pale di San Martino! An awesome sunrise behind Cimon della Pala and the Pale di San Martino this morning from Passo Rolle on my way out of town. Gotta love it! Posted in Alps & Europe and tagged Dolomites, Italy on December 5, 2010 May 19, 2013 by Jack Brauer. Panorama of Cimon della Pala and the Pale di San Martino range on a glorious December afternoon after a storm has lifted. 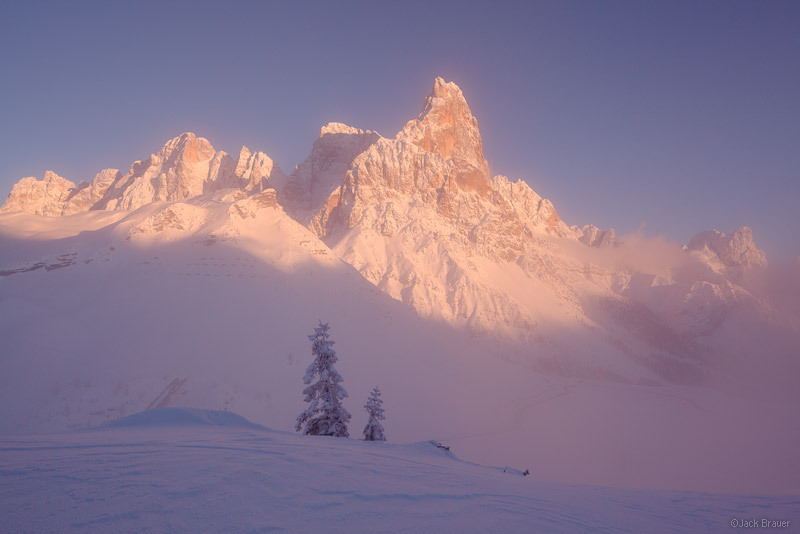 Cimon della Pala is revealed glowing in sunset light as low clouds thin out from Passo Rolle. 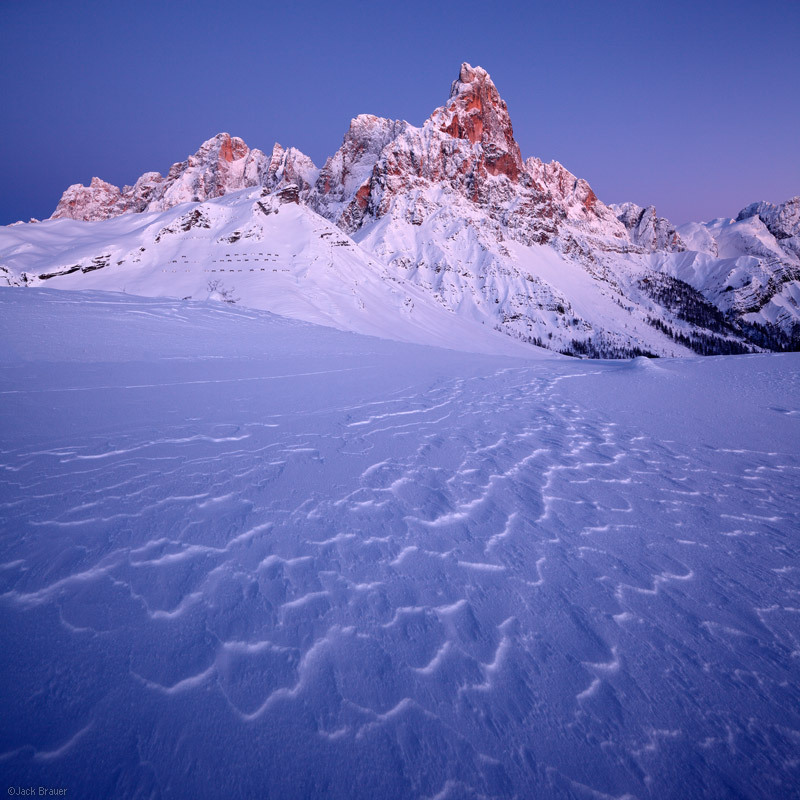 Winter enrosadira sunset light paints the peaks of Cimon della Pala and the Pale di San Martino range - December. Cimon della Pala illuminated by dusk light - December. Sunrise view from Daniela’s deck, looking towards cloud-covered Mezzano. Not too shabby to see right out of bed! 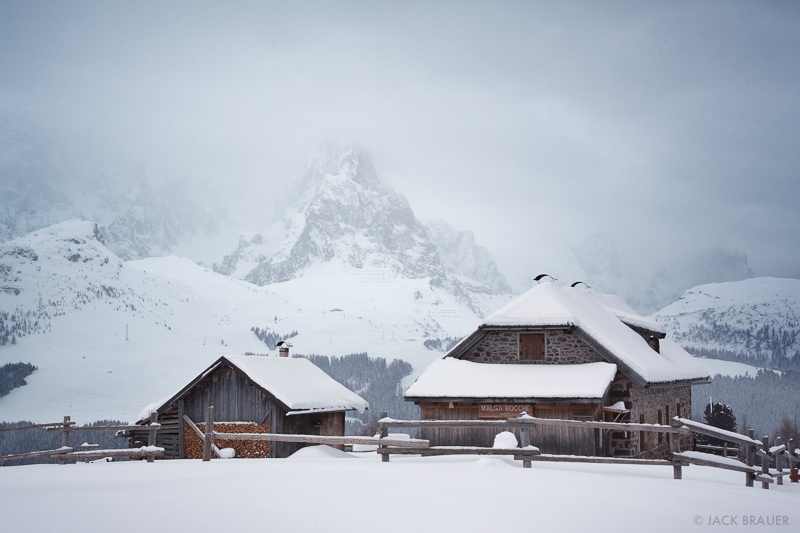 Posted in Alps & Europe, Skiing/Snowboarding and tagged Dolomites, Italy on December 3, 2010 May 19, 2013 by Jack Brauer. I am in the town of San Martino di Castrozza this week. I was here during my first visit to the Dolomites six years ago, and this was one of my favorite spots. 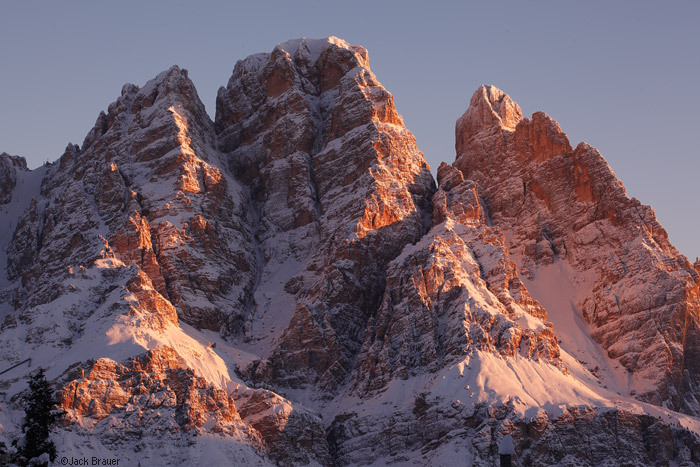 The Dolomites boast many amazing jagged peaks, but the peaks of the Pale di San Martino range are impressive even by Dolomiti standards. 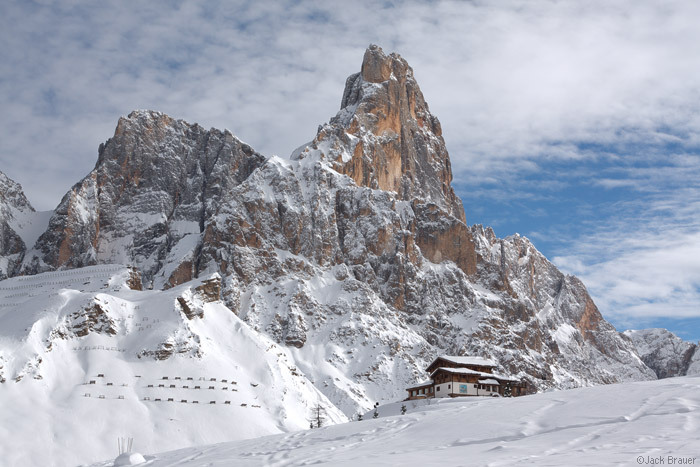 And perhaps the most impressive of these peaks is Cimon della Pala, a rugged 3184m peak that towers over Passo Rolle and the town of San Martino far below. I’ve never seen a peak that has so many faces as the Cimon… depending on your altitude and angle of view the shape of the peak morphs into entirely difference profiles and characters. Here’s a photo of the same peak in the summertime, from a different angle, for example. Posted in Alps & Europe and tagged Dolomites, Italy on December 1, 2010 May 19, 2013 by Jack Brauer. 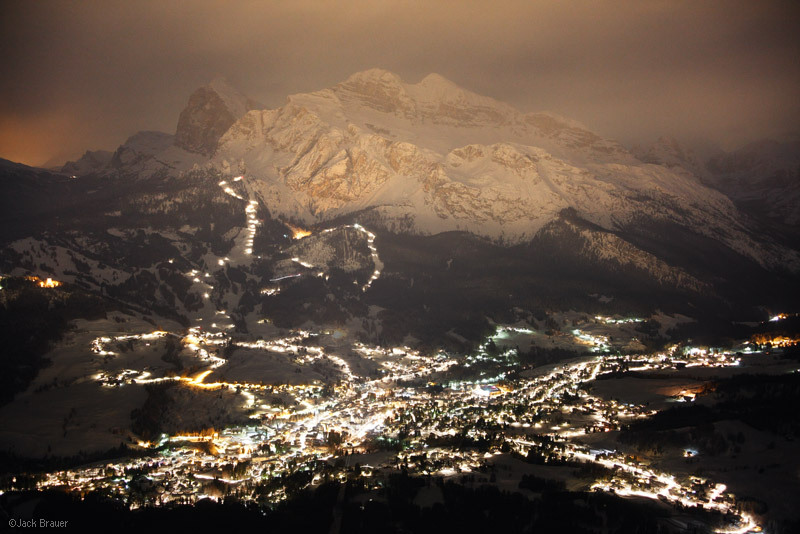 Nighttime lights of Cortina d' Ampezzo illuminate the mountains above town on a snowy November night. Today I scored one of my all-time best powder days! More on that below. Anyhow, six and a half years after climbing via ferrate routes around Cortina d’ Ampezzo and the Dolomites in the summertime, I have returned… this time for winter! Yesterday I took a tram up to the Refugio d’ Faloria, a plush hut situated on the edge of a huge cliff about 900m (3000 ft.) above the town of Cortina. I spent the night up there, enjoying not only a primo view of Cortina, but also a slopeside location to kick off the ski area’s opening day on Saturday. Sunrise on Monte Cristallo. Though it was dumping snow all day on Friday, Saturday brought bluebird skies. 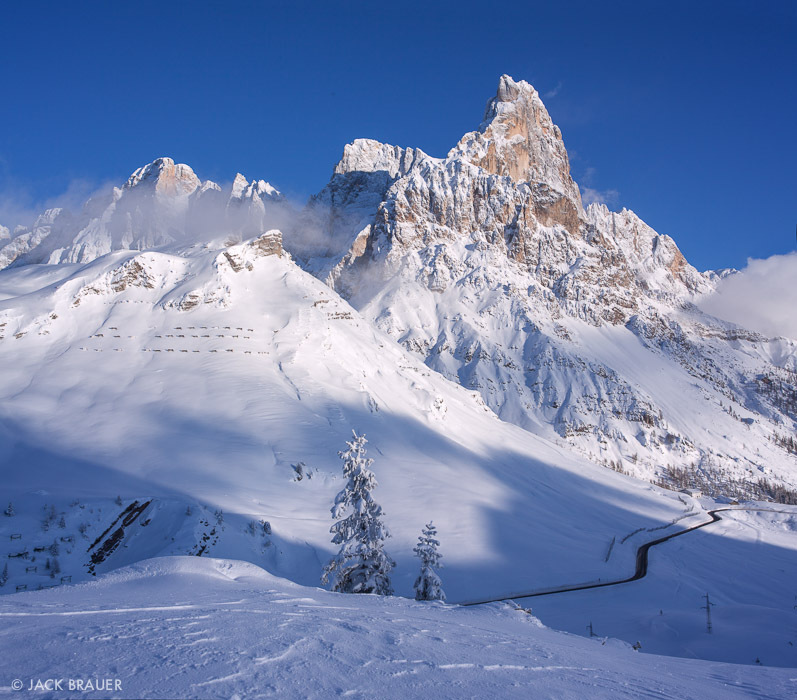 Posted in Alps & Europe, Skiing/Snowboarding and tagged Dolomites, Italy on November 27, 2010 May 19, 2013 by Jack Brauer.